Support for 6Gb/s SAS and SATA hard drives. 8 port, 2 internal 8087 connectors, PCIe 2.0 x8 interface, 800MHz PowerPC, 512MB Cache, RAID 0, 1, 5, 6, 10, 50 and 60. No cables included. The eight-port MegaRAID® SAS 9260-8i provides a new level or performance and data protection for internal storage systems using up to 32 SATA or SAS hard drives or solid state drives. With data transfer rates of up to 6Gb/s per port, the MegaRAID SAS 9260-8i brings users new features and improved performance while continuing to support all the features of the previous 3Gb/s SATA and SAS generation. 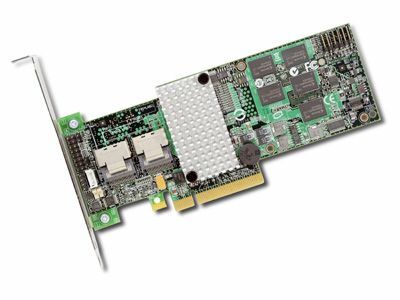 This value line controller, ideal for inside-the-box connectivity, employs the latest in RAID-on-Chip technology and complies with the PCI Express® 2.0 specification for high-bandwidth applications.